San Francisco’s famous landmark, the Golden Gate Bridge, spans across the bay while sailboats glide beneath. In the foreground, water splashes against the rocky shore. Thomas Kinkade’s use of detail and light creates an image so realistic you can almost feel the mist on your skin. 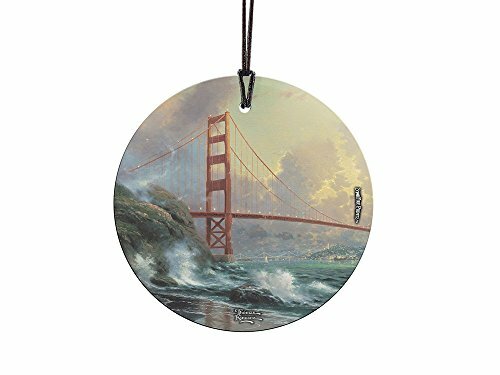 Kinkade’s Golden Gate Bridge, featured on this StarFire PrintsTM Hanging Glass, comes with a hanging string for easy display. StarFire Prints hanging glass are photographic quality prints on translucent glass. Featuring artwork from your favorite movies, these prints are an elegant way to display your fandom to the world. These images are permanently fused into the glass, resulting in a semi-translucent print that captures the natural light, enhancing the color display and making each image a true piece of art.The glass is scratch and fade resistant and arrives to you ready for display. ✅ GREAT FOR GIFTING AND COLLECTING – Comes with hanging string for instant, easy display.